Are you looking for an easy appetizer recipe? 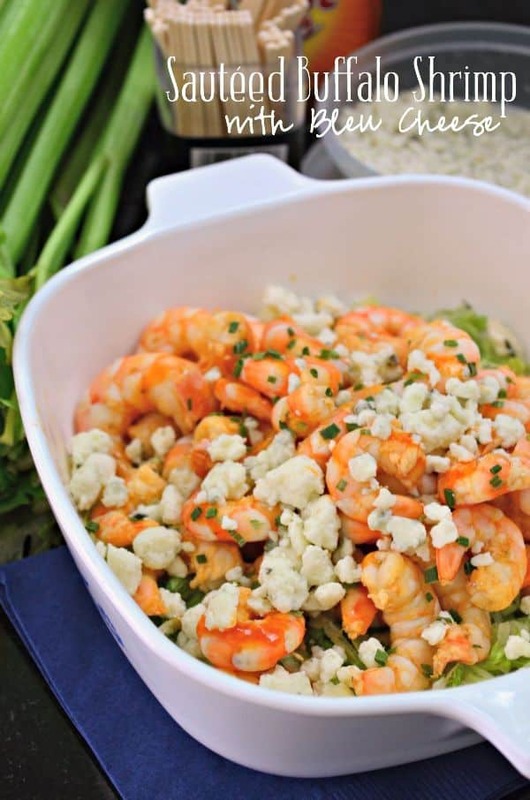 Try my recipe for Sautéed Buffalo Shrimp with Bleu Cheese! You can make the entire recipe from start to finish in 20 minutes. You can prep the shrimp prior to cooking or just before you cook. Either way it works. We love buffalo sauce in our home so I figured by sautéing shrimp in buffalo sauce it would be a winner and sure enough I was correct! I have a few other buffalo sauce recipes in mind these days, but time keeps getting the best of me. I’m just happy I finally got to work on this recipe and share it with you guys. Bare with me over the next few weeks. We have lots of stuff going on in our life. All good things, but just crazy busy. I’m going to try my best to continue to post a few times each week. Before you leave a comment… no I’m not pregnant. We are in the process of moving into a new home! I made this recipe actually at my in-laws house over the 4th of July! Since moving I’ve been making a lot of recipes over their house. It’s the only time I have to work on recipes and have someone to occupy Ryder while I “work”. Of course everyone doesn’t mind playing with him and getting paid in yummy food. The rental that we are currently in for the next month (while we wait to close on our home), has a horrible layout and it makes it almost impossible to cook and watch Ryder at the same time. So no real time to work on recipes! 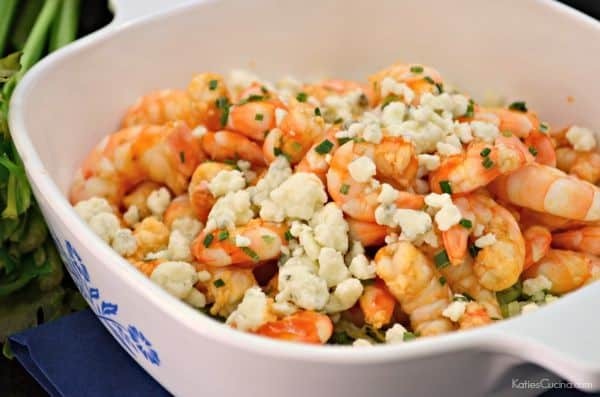 So, if your busy like me and need to bring an appetizer to a party or maybe your hosting a party give my recipe for Sautéed Buffalo Shrimp with Bleu Cheese a try. Serve it with tooth picks or with sliced crostinis! Either way this appetizer is sure to be a hit! Peel and clean shrimp. Pat dry the shrimp and place in a bowl. Add the buffalo hot sauce, minced garlic, and lemon juice. Mix well and let sit for 10 minutes. Preheat a large saute pan over high heat. Pour in the grape seed oil, swish around the pan. Then add in the shrimp. Sauté for 5 minutes, mixing often. Place shredded lettuce in a bowl. Then pour the shrimp onto the bed of lettuce. 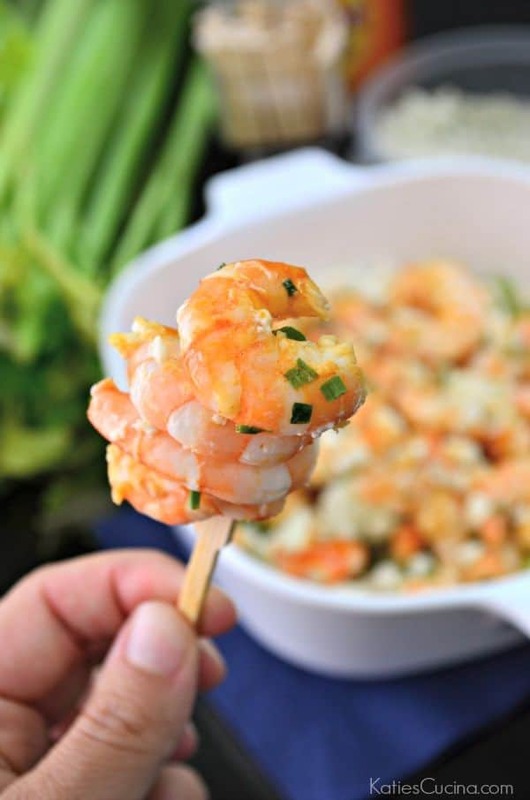 Sprinkle the shrimp with green onions and bleu cheese crumbles. Enjoy immediately.